Early packs of spruce gum illustrate the tree that produced the gum’s natural materials. The earliest version of chewing gum in America was resin produced by spruce trees. Native Americans collected the sticky stuff that oozed from the tree trunk each spring and chewed it for medicinal or recreational reasons. Once Europeans began interacting with local tribes, the practice of chewing spruce gum spread. Halfway through the nineteenth century, John Bacon Curtis (1827-1897) and his sons extracted the spruce pitch and boiled it down to a thick syrupy mass, throwing in a bit of sugar to add flavor while they stirred. Once ready, the molasses-like substance was rolled into thin sheets and chopped into small pieces. They named the resulting product “State of Maine Pure Spruce Gum.” Curtis peddled it around the Northeast beginning around 1850. The gum quickly caught on and soon after Curtis established a factory in Maine to churn out larger quantities. Americans liked spruce gum. For a penny a stick, children and adults alike could partake in this cheap and agreeable product. Mark Twain’s character Tom Sawyer shared a stick of gum with Becky Thatcher, and described to Huckleberry Finn the fantasy of magical genies building a palace out of diamonds and filling it with chewing gum. Meanwhile, adults chewed spruce gum as a substitute for tobacco or alcohol, or because they believed it cured indigestion. After the Civil War, consumer demand grew to the point where the annual harvest of spruce was estimated at over 150 tons and valued at $300,000. Elsewhere in the United States, businessmen tried developing alternatives to spruce gum. One option was gum derived from paraffin wax, a distillation of crude petroleum. Curtis experimented with paraffin as well, but William Semple (1832-1923) was the first to patent the use of it in 1869. Semple’s recipe consisted of dissolving rubber in alcohol and mixing it with chalk and powdered licorice-root, among other ingredients. Paraffin gum was decidedly not sweet and people who tried the experiment disliked it; thus, Semple’s gum never made it to the commercial market. In 1869, the same year Semple patented his paraffin recipe for chewing gum, the former president of Mexico General Antonio López de Santa Anna met and collaborated with scientist and inventor Thomas Adams (1818-1905). Santa Anna traveled to the United States in the hopes of raising money through the exportation of a latex-like material called chicle, which came from the Sapodilla tree in the Yucatan Peninsula. Adams bought chicle off Santa Anna to see if it could be used as a substitute for vulcanized rubber for industrial purposes, but it wasn’t suitable. Disheartened, Adams likely passed one of the many druggists in Manhattan who sold spruce gum to children for pennies. Perhaps realizing he had another highly chewable material on his hands, Adams began experimenting with chicle to see if it could be used as an alternative. This time fortune was in his favor and the initial batch of chicle-based gum he offered through a druggist sold out within a day. Adams’ recipe was simple: chicle, caramel paste, glucose, powdered sugar and flavoring. Sugar ended up as at least half the weight of a strip of gum. Adams wrapped his sticks in colorful paper, stamped his brand on the packaging, and “Adams New York No. 1” chewing gum was born. With a hit on his hands, Thomas Adams opened up a shop in New Jersey in 1871 and continued to innovate not only with flavors, but with advertising and distribution. Trade Card for Adams’ Tutti-Frutti Chewing Gum, ca.1870-1900. Museum of the City of New York, 97.5.5. The growth of print culture in the nineteenth century resulted in a plethora of cheap graphic advertising for a variety of products, chewing gum included. Trade cards for Adams’ chewing gum used colorful and appealing imagery to draw the eye. The pictures often had little to do with the actual product, but marketing copy on the reverse side of the card above detailed the myriad of health and nutritional benefits for chewing Adams’ brand of gum. Adams founded Adams Sons & Company in 1876 and the following decades witnessed an explosion of gum’s popularity and the incorporation of dozens of companies competing to find and trademark a flavor that would hit it big with the public. 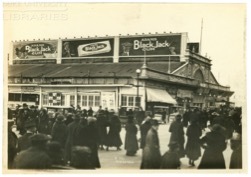 Gum Billboard, c.1920, R.C. Maxwell Co. Records,Duke University Library Digital Collection. American Chicle Co. Headquarters, Long Island City, Queens Borough, New York City, 1910-1920, Queens Borough Chamber of Commerce. Retrieved from http://www.archive.org. Others attempted to emulate William Semple’s model, including George E. Clark who manufactured a paraffin-gum called Busy Bee. See James Harrison Kennedy, A History of the City of Cleveland: Biographical Volume (Cleveland: Imperial Press, 1897), 181. Among Adams’ most popular early brands was a gum that tasted of licorice, called Black Jack. He then developed California Fruit, the first fruit-flavored gum, and followed it up with Tutti-Frutti. which remains one of the company’s most popular flavors. Companies included the Maine Gum Company, the B.C. Oglivie Gum Company, Roudlett Brothers, Garceau and Thistle, The Happy Day Gum Company and the Hiawatha Gum Company. Chewing Gum” in the Oxford Encyclopedia of Food and Drink Vol. 2, p.145.